Some people seem to know instinctively how to grow herbs, while others need to learn. The methods vary based on whether you plan to plant them indoors or outdoors. Some people sow seedlings that they buy from a plant nursery or gardening stores, while others start from scratch using seeds. The more adventurous types use clippings they take from herbs they bought to use in their cooking. Before looking for guidance on how to grow herbs, determine what you want to plant. Some people plant only herbs that they plan to use themselves. Others plant a variety so that they can give some away to friends and family. Whether you start out with familiar herbs like basil and parsley, adding to your collection is easy once you get comfortable with gardening. Ideal herbs for beginners include thyme, mint, fennel, and dill. Container for sowing the seeds; this can be a commercial seed tray or any suitable container. The size will depend how many seeds you plan on sowing. Once plants are at least 2 inches tall, remove them carefully and repot in containers set aside for this purpose. Keep the soil that is around the seedling when replanting. At this stage you can also plant herbs in your garden outside if that is where you prefer to grow them. Place container in a well-ventilated area that has adequate sunlight. When using soil, or planting outdoors, it is important to pay attention to how fertile the soil is and its capacity for drainage. Look at what plants are growing in the area and consider how well they do. This is usually a good indicator of soil fertility. One rule of thumb when it comes to knowing how to grow herbs is never to over-water them. Too much water will cause the plants to rot. In some cases it can cause insects and pests to thrive. It is necessary to check the herb garden or containers for weeds and remove them. 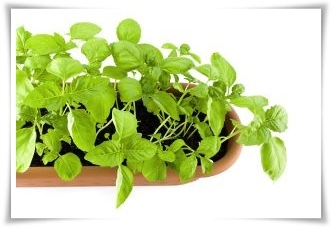 Doing this provides more space for herbs to grow and thrive and prevents pest infestation. Some gardeners will place organic material around the roots of the plants. It is advisable to be on the lookout for slugs or similar pests when you use kitchen waste such as tea and vegetable matter as mulch. When learning how to grow herbs the climate and time of year play a big role. This information will help ensure that you have fresh herbs year round. Many common herbs will thrive in containers indoors even during the winter months. If your plants are outdoors, you can safely transfer them to pots and keep them inside during the cold months. If you have a few hours of sunlight during winter, place them outside for a while. Even using florescent lighting can help you grow herbs during the colder periods.